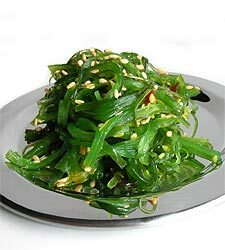 It is also known as Wakame and is a sea vegetable, or edible seaweed. It has a subtly sweet flavour and is most often served in soups and salads. 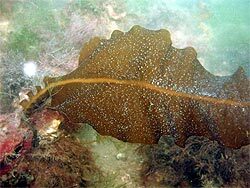 Sea-farmers have grown wakame for hundreds of years in Korea and Japan and it has been nominated as among 100 of the world's worst invasive species according to the Global Invasive Species Database. 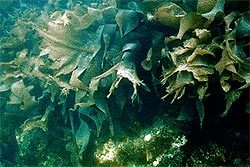 Japanese seaweed is an opportunistic weed which has the ability to rapidly colonise disturbed or new surfaces. However, in general it prefers sheltered reef areas which are subject to oceanic influence. The seaweed will grow in the intertidal zone down to the subtidal zone, to a depth of 15 metres. It does not tend to become established successfully in areas with high wave action and an abundance of local vegetation. It is native to cold temperate coastal areas of Japan, Korea and China. In recent decades it has become established in New Zealand, the United States, France, Great Britain, Spain, Italy, Argentina and Australia. Undaria pinnatifida can form dense forests, resulting in competition for light and space which may lead to exclusion or displacement of native plants and animals and effects on the food chain. Species which may be susceptible to displacement include abalone, rock lobster and oysters. It will also foul marine infrastructure such as mussel lines, vessel hulls and fish cages. Following periods of rough seas, the seaweed tends to wash up on beaches where it rots and smells. Physical removal of plants has been trialed in Australia with limited success, due to the difficulty in removing them at the elusive microscopic gametophytic stage. While sea urchins do graze on the seaweed, they are not likely to offer a realistic form of biological control.